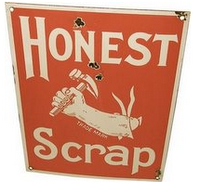 Sondre Lyn bestowed upon me the Honest Scrap award! 1. When I was a kid, I loved "Laverne and Shirley." I was always fascinated by the little basement apartment they lived in and the fact that they worked at a brewery. I don't know why. I just thought they were fun. They had perhaps the coolest intro montage ever (besides Friends). On the show, Laverne drank Pepsi and milk mixed together. One time I tried it and it was gross. I was sorely disappointed. 2. I've had 4 children and would go through 10 more deliveries before I would endure one more 40 week pregnancy. The carrying and waiting part was the WORST for me. 3. The only time I've EVER said "Shut Up" to anyone (that I recall) was to my husband during labor when I was in transition with Southern Gentleman. I had a spinal block and realized that it had worn off and there wasn't enough time for another one before I delivered. I think Doc forgives me but it took a while for him to get over it. I think I shocked him but the fact that, that was the worst thing that came out of my mouth during 4 deliveries is pretty good, I think. 4. 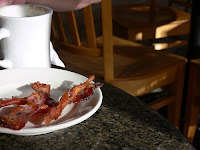 I LOVE the smell of bacon and coffee in the morning. It makes me smile and it feels like home. I think that, that smell will be the smell of my mansion in Heaven! 5. I'm a straight shooter. If you don't want to know what I really think, DO NOT ask. On the other hand, I try really hard to word my opinions in ways that are not too harsh (unless I'm venting.) Sometimes my sisters will call me and tell me they need me to be DW to them...meaning, speak the truth as I see it as plainly as possible. 6. My least favorite chore is unloading the dishwasher. Guess what Lou, Lou's first and only household chore is? 7. If my life is in chaos, I clean out my SUV. It is my way of having control over one little thing. I love my truck. Doc bought it for me for our anniversary 2 years ago. He really knows how to spoil me! 8. I love shoes and have a habit of buying sassy high heels (on sale) even though I don't really have anywhere to wear them. Truth be told...my kids get more use out of them than I do because they like to clomp around in them. 9. I HATE to talk on the phone unless I'm in the mood for it. I do not answer the phone if I don't recognize the number on caller ID. 10. I never pictured myself ending up having the life that I have but I believe that some of the best blessings are ones that God gives us and we didn't even know we wanted. He knows us better than we know ourselves because he is our creator! Ditto on the phone, dishwasher and pregnancy. And, while "let's be quiet, please" is my first choice, I will concede the "fewest times using the word-combo 'shut-up'" award to you!